Check your emails from Chickadvisor! 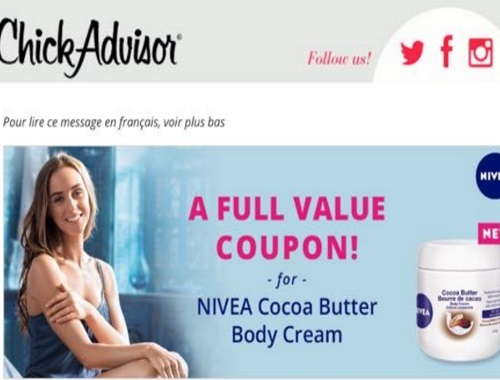 Chickadvisor recently gave away 1000 Nivea Q10 Body oils for review to their Product Review Club members. I wasn't chosen so I guess as a consolation prize I get a coupon for a full-sized Nivea Cocoa Butter Body Cream! The coupon has been sent to the address you provided at the time of application, and should arrive within 2-3 weeks. You do not need to do anything from the email, the email is just to alert you that you were chosen to get the coupon! Click here to join Chickadvisor's Product Review Club if you haven't yet.